The Nokia 8 Sirocco has a tough stainless steel core wrapped in Gorilla Glass 5. The edges curve into the metal frame, giving the phone a compact look and feel. It’s comfortable to hold, and feels like something that’s built to last. Despite it being so slim (just 7.5mm at its thickest part), HMD Global says it’s the most robust Nokia phone made so far. The Nokia 8 Sirocco’s 5.5-inch display curves at the edges, giving you a lot of screen to immerse yourself in. The quality is amazing. It’s a Quad HD OLED display, so everything you look at is incredibly sharp, bright and colourful. And the blacks are deeper than deep – that’s something that OLED is renowned for. The Nokia 8 Sirocco sports a dual lens 12MP and 13MP main camera, tuned by the German optics brand Zeiss. The setup consists of a normal and zoom lens that work together to give you as much of the bokeh effect (that professional looking background blur) that you want in your photographs. The camera has a large aperture of f/1.7 capable of taking clear shots in low light conditions, and there’s also a lossless optical 2x zoom feature. This lets you get in twice as close to the action, without losing any quality at all. If you can’t resist a selfie, don’t panic – there’s a 5MP wide-angle camera at the front of the Nokia 8 Sirocco. It also supports Nokia’s ‘bothie’ mode, so you’ll be able to take those trendy split-screen photos and videos that show the front and back simultaneously, if that’s your thing. The Nokia 8 Sirocco is powered by one of Qualcomm’s latest processors, the Snapdragon 835. It’s backed up by 6GB RAM, so this is a phone capable of handling anything you can throw at it with ease. Oh, and there's also a huge amount of internal storage space for your favourite apps, games and videos - how does 128GB sound? And then there’s Android One. All of Nokia’s new smartphones have it on board, and it really improves the user experience. Android One gives you ‘pure Android’, so there are no added apps or services to wade through - bye bye bloatware. You’re also guaranteed a full two years of system updates, along with monthly security updates. 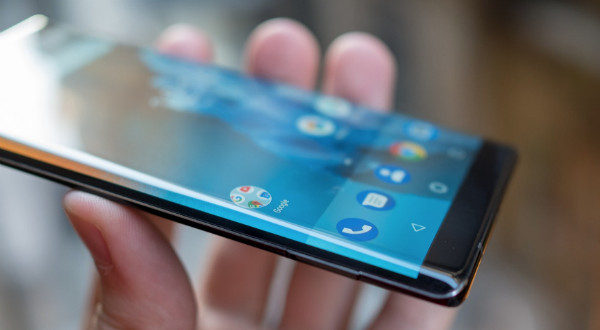 So if you’re thinking of investing in a Nokia 8 Sirocco, it really is a phone for the long term. Interested? If you want the very best of Nokia, you can order the Nokia 8 Sirocco from Carphone Warehouse and claim a free Google home mini speaker worth £49. Or if you’ve got a question, post it below and we’ll do our best to give you an answer.